One of the biggest barriers that we find when it comes to cooking is something that you may or may not expect. It isn’t having the right ingredients, knowledge, tools, gear or the skillset that makes cooking easier or more difficult. The most challenging part about cooking and any kind of food preparation is finding the time or making the time to do it. Thankfully, there are lots of kitchen appliances and tools that can make our lives easier and make cooking faster. With the innovations that we’ve had in kitchen take, we can save time while still making delicious, savory meals that are packed with all that home-cooked flavor that you have been missing. Whether you want to use a roaster oven weekly for roasting chicken, turkey, roasts and vegetables or you just need a little extra oven space for cooking for the family on the holidays, roaster ovens will be an incredibly helpful appliance in your kitchen. 2 What is a Roaster Oven? 3 How Does a Roaster Work? 4 What can be Cooked in a Roaster Oven? Let’s take a look at the first roaster oven on our list, the Oster 22 quart. 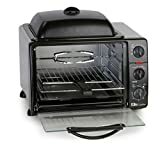 This large roaster oven can roast 22 quarts of food and one time, and is perfect for large chickens, turkeys, beef or pork roasts with plenty of room for vegetables too. One facet of this model that we really love is that it has a self-basting lid that saves time and is energy efficient as well. It prevents heat from escaping so it can save energy and cook your meals faster. This oven also has a gorgeous stainless steel finish that is durable, clean and is perfecting for holding the heat in and roasting your meals. It even comes with an enamel over steel roasting pan which gives even better heat distribution and makes cleaning up a breeze. ✓ It comes with an enamel coated cooking pan which evenly distributes heat throughout your oven and is also really easy to clean, when you are finished cooking. ✓ This oven actually has the unique ability to cook muffins, rolls and even sheet cakes. So it works more like a standard oven. Check out a full review of Oster 22-Quart Roaster Oven. This is a slightly smaller Oster from the oven model that we just looked at, and can still cook up to 16 quarts of food at one time. What is really impressive about this roaster oven is that it also doubles as a smoker. You can actually take this roaster oven outside and use it to smoke meats and vegetables. That’s a unique feature that you don’t see in a lot of roaster ovens. It even has removable pockets that are meant to hold your wood chips when you are smoking your food outdoors. This model also includes the enamel coated stainless steel roasting pan, which makes for better heat distribution, faster cooking and easier clean up. It also comes with a roasting rack so that you can perfectly roast a whole turkey or chicken. 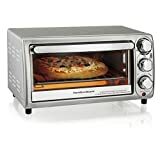 This unique toaster oven can also bake baked goods like cookies, muffins and cakes. ✓ The most impressive feature of this toaster oven is that you can use it as an outdoor smoker. All you have to do is take this little toaster oven outdoors and you can have a perfectly smoked roast or poultry in a matter of hours. ✓ It even comes with pockets that you can load your wood chips into when you are smoking outdoors. ✓ This model comes with the classic Oster temperature control which makes it simple to select the temperature that you need, so that your oven can put in the work for you. ✘ This works great as a roaster and just okay as a smoker. That feature may be a little oversold. Check out a full review of Oster CKSTROSMK18 Smoker Roaster Oven. And even bake your foods in this oven. This model has an advanced temperature control that gives you all of these options on the same dial. This comes with a stainless steel body and lid with a removable cookwell, which makes it really easy to clean after you are done using it. It also uses a patented circle-of-heat heating element to give your food an even cook on all sides. ✓ We really appreciate that this model has so many different functions for cooking including steaming, slow cooking, roasting, baking and roasting. Check out a full Nesco 481825PR Roaster Oven Review. This is yet another great 18 quart roaster oven that lets you roast of temperatures up to 450 degrees. It comes with a removable stainless steel roasting rack as well as a stainless steel, enamel coating roasting pan, which give you plenty of versatility when cooking. This unit is perfect for cooking large roasts and large meals. It even comes with a one year warranty that will take care of your oven, should it have any flaws or defects. ✓ Comes with a baking rack and a baking pan for large roasts, vegetables, poultry, etc. The last stop on our review is with the Hamilton Beach 22 quart roaster oven. The outer shell of this oven is made of high quality stainless steel and it is perfect for roasting, baking and cooking food for large parties. It utilizes a simple control knob with a range that goes up to 450 degrees. This model also includes handles that are cool to the touch when you are roasting, a baking rack and a baking pan that are all easy to remove and clean. The user manual even comes with recipes that you can test in your oven. A roaster oven is a mobile kitchen appliance that you can use to roast your foods. Roaster ovens are a little different than traditional ovens in that they are portable, compact and are engineered slightly different to cook your foods more thoroughly, and to help them retain as much moisture as possible in the cooking process. Roaster ovens are really handy for cooking juicy meats and roasting vegetables. 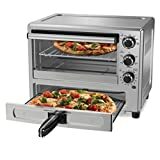 If you have limited space in your kitchen or you have a small oven, roaster ovens are handing for expanding the amount of usable oven space you have and they are really easy to store after you are done using them. Most average sized roaster ovens can fit easily into your kitchen cabinets. How Does a Roaster Work? The beauty of roaster ovens is that they are very simple to use. You don’t need to be an expert chef or have any real previous experience in cooking to figure out how to use a roaster oven. Most every roaster oven just needs to be plugged into an AC power outlet in your kitchen before you can get started using it. Roaster ovens will have some kind of temperature selection dial, function or menu that lets you choose the temperature at which you want to roast your food at. All you really have to do is take the food that you want to cook in your roaster oven, prep it or rinse it if you need to, place it into the roaster oven, select the temperature you want to cook at and set a timer for monitoring your food. The roaster oven works slightly different than your typical kitchen oven. With conventional oven, your food can be sitting on a tray several inches away from the heating coils. This can cause for an uneven cooking of your foods, particularly with meats, and can cause them to lose their natural moisture. A convection oven or an air fryer which has air circulation can cook food more evenly than a conventional oven but the food will be crispier than a roaster oven. How roaster ovens differ is that they keep the food that you are roasting closer to the heat source. This allows them to roast your food more evenly while allowing your foods to naturally retain their moisture. What can be Cooked in a Roaster Oven? So what are roaster ovens the most useful for making? – And other types of vegetables. If you enjoy dietary staples of meat and vegetables, you will find your roaster oven to be quite handy in making meals. The biggest drawbacks to roaster ovens are that they have a narrow spectrum of foods that they are designed to cook well. And pretty much anything else that is soft and doughy in substance. Let your toaster oven do the job. There are several best toaster ovens under $100 that you can buy separately. Other than having a fairly limited scope of what you can cook in a roaster oven, these ovens are excellent when it comes to roasting meats and vegetables. What are some of the biggest benefits and downsides of owning and using a roaster oven? ✓ These ovens are really easy to use. All you really have to do is set the temperature dial on your oven and set a timer so that you know when to check it. ✓ These ovens provide a time-saving, low-maintenance cooking solution that are great for busy individuals and people with families. ✓ They are great for the holidays and big family gatherings. If you have a limited amount of oven space and you normally host people for the holidays, roaster ovens are awesome for making more food and easily extending your functional cooking space. ✓ They are really affordable. You aren’t going to have to spend an arm and a leg to buy something that will save you a lot of time and a huge hassle when you are cooking. ✓ They are perfect for roasting meats and vegetables. These ovens are designed to cook your food close to the heating element which allows them to be cooked more evenly. They are also great for making sure that your food is able to naturally retain moisture, which makes them taste even more delicious. ✓ They are easily accessible and you can buy them in just about any kind of home goods store or kitchen appliance store. ✘ One of the most unfortunately qualities about roaster ovens is that they do not offer a ton of versatility when it comes to cooking. ✘ Unlike slow-cookers that can cook and prepare virtually anything, roaster ovens are pretty much limited to meats and vegetables. 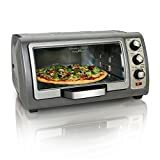 ✘ You cannot use this oven for breads, pizza, baked goods, rolls or anything that has a doughy substance. The first thing that you will want to examine closely when you are shopping for a roaster oven is the temperature range that it gives you. The higher and the lower the temperature range that your roaster oven gives you, the more versatility of cooking you will have and wider range of foods that you can roast in it. How big is the lid and what are the lids materials made out of? The size of the lid is going to affect how high you can stack food in the oven or how big of a chicken, turkey, or roast that you can cook in it. The material of the lid will give you an idea of how well the roaster oven holds in and radiates heat throughout the rest of the oven. That will give you a better idea of how evenly and thoroughly it is going to cook your meals. How big is the roaster oven? Roaster ovens will usually label their sizes in quarts so that you can make sure that you can get a big enough oven to use, but make sure that it is small enough that you can store it. What kinds of control options does your roaster give you? Some roaster ovens will have different control options that can include timers to assist you while you are cooking. How big is the roasting pan that comes with your oven and what is it best for? Make sure that you check the materials and size of your pan. Does your oven come with a rack? If so, does it come with a pan to drain the moisture off of your food. Make sure that you take a detailed look at all of the features of the roaster oven that you are considering before you decide to buy one. Now that we have discussed some of the features that you want to be looking for in a roaster oven, let’s take a look at some of the top performing roaster ovens on the market. What roaster oven do you think looked the best or most appealing? For us, the best happened to be first. 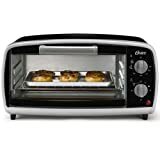 This Oster 22 quart roaster oven really does have everything that you need on one compact oven. It seems to have the highest quality materials when it comes to sealing, basting and roasting your food to perfect. It helps retain moisture and even saves energy while you are cooking. Those are just a few of the key reason that this toaster oven is our winner.